South African police fired tear gas, rubber bullets and stun grenades to disperse protesters near a mine owned by the world's top platinum producer. raised fears that unrest in South Africa's mining sector is not over. Hours earlier, Lonmin platinum mines agreed to give its workers a hefty pay raise following a violent five-week strike in which 45 people were killed. Police spokesman Dennis Adriao said the crowd in Rustenburg had gathered illegally at an informal settlement. He said police took action after the group refused orders to disperse. The mining industry is South Africa's largest. The union representing South African platinum mine workers signed the deal with Lonmin late Tuesday. The agreement calls for workers to get a 22 percent pay raise, less than what they originally demanded. They will also receive a one-time cash payment of $250 to compensate for the time they were off the job. The Lonmin workers are to return to work on Thursday. Lonmin Platinum's miners celebrated a wage deal Wednesday that ended a deadly strike, but labor unrest at a different mine took a violent turn when police broke up what they called an illegal gathering near the town of Rustenburg. "We arrested 19 people today for being a part of an illegal gathering and in possession of dangerous weapons," said Gauteng province police spokesman Dennis Adriao, who said between 400 and 500 people gathered early Wednesday. "Police asked them to disperse and when they wouldn't, police used tear gas, stun grenades and rubber bullets to disperse the crowd," said Gauteng province police spokesman Dennis Adriao. "We've said from the start that we would not tolerate illegal gatherings." That strike is at Amplats mine near Rustenburg, owned by Anglo American Platinum which earlier claimed its workers were not striking, but that it shut down operations to ensure their safety against violent threats. Spokeswoman Mpmi Sithole said Wednesday that all five mines in Rustenburg have reopened but they cannot say how many have returned to work. At Marikana, where the protracted strike by Lonmin miners has ended, thousands gathered and sang the national anthem in piercing heat, holding up umbrellas to block the sun. Workers cheered and laughed as they walked into the Wonderkop stadium in Marikana near the Lonmin mines. Many of Lonmin's 28,000 workers said they were happy to return to work Thursday and that the strike that saw 45 people killed has finally come to an end. Lonmin agreed to a gross pay of 11,078 rand ($1,385) to rock drill operators who had been demanding a monthly take-home wage of 12,500 rand ($1,560). They also agreed to give all miners a once-off payment of 2,000 rand ($250) as a bonus for returning to work. A statement from the company said that miners will receive between 11 and 22 percent wage increases. "I am so happy," said Mvenyeza Luhlaziyao, 48, a painter at the mines. "I try to forget the past and continue to move forward to build on the company and make it all all right. We must continue to build the company and management must listen to us in the future. People didn't care about us, that's why we decided to go on strike." Riddick Mofokeng, another miner, said he also felt good about the deal. "It is not what we expected to get, but it is great," he said. "Most of the people, we are ready to go back to work." Zolisa Bodlani, a leader for the mine workers in the strikes, said the agreement is noteworthy. "If no people were killed, I'd say this was a great achievement," he said. "We've never in the history of South Africa had such an increase of pay as 22 percent." Two wives of winch operators expressed their pleasure that the strike had ended. "The weeks without pay were terrible," said Plaxedes Matemba, a 39-year-old mother of two. "It will make life better for us," she said of the pay raise. "We expect better changes again ... there will be no more provoking, no more noise, no more beatings," she said. Portia Mhlanga, a 22-year-old whose partner is a brick layer, said the return to work will also be good for her. "People will now buy things, and there will be more work," she said. Bodlani said the workers will return to Lonmin's Marikana mine on Thursday morning, but they will not go underground. "They will receive counseling and training for a few days," he said. The miners living in the Wonderkop informal settlement also hope to make a memorial of the rock hill where they saw 34 of their colleagues killed by police, he said. Joseph Mathunjwa, of the Association of Mineworkers and Construction Union, said that they will be putting a trust fund together for the families who lost members to the shootings. Delegates from unions, strikers not represented by unions, and the London-registered company signed the final wage deal late Tuesday night in Mooinooi, close to Marikana. The agreement for the company's miners ends a strike with political and economic repercussions, but does not resolve South Africa's huge economic inequality and the government's failure to address massive unemployment and poverty. 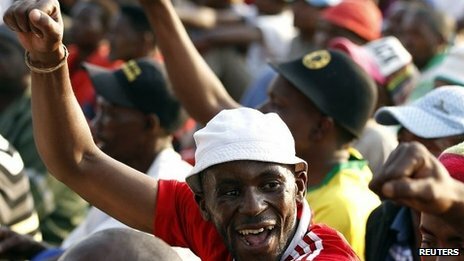 The South Africa Press Association reported that Cosatu welcomed the end of the strike. "We hope that peace and safety will now be restored to the mine and the surrounding communities," said the Congress of SA Trade Unions (Cosatu), whose affiliate the National Union of Mineworkers (NUM) had been publicly criticised by many of the mineworkers on strike, according to SAPA. Police dispersed crowds of protesters around Anglo American Platinum Ltd.'s (AMS.JO) mines Wednesday morning using tear gas and at one point rubber bullets as workers there say they will continue to stay on strike to demand higher wages. Police spokesman Dennis Adriao said forces on the ground around Anglo Platinum's Rustenburg mine ordered an illegal gathering to disperse but the group held their ground. He said police then fired tear gas and used stun grenades to break the crowd. At one point, he said, rubber bullets had to be used next to one of the informal settlements because the protesters resisted more heavily, adding he didn't have more details at the moment. Anglo Platinum last week closed five mines as a strike spread through the Rustenburg area and workers at its mines joined to demand higher wages. The company said it reopened its mines on Tuesday but that not all workers returned. Anglo Platinum confirmed that police did disperse a crowd at the Sondela informal settlement, but didn't have more information. The police crackdown comes as the government said last week it wouldn't tolerate illegal gatherings any longer, or those where groups didn't apply for permission from the police to meet, and would use force to disperse crowds and arrest those who disobeyed. South African police have fired rubber bullets and tear gas to disperse protesters near a mine owned by Anglo American, a day after a deal ended a strike in Marikana. "We are not tolerating any illegal gatherings," a police spokesman said. The strikes have spread to other mines in South Africa, one of the world's biggest producers of precious metals. On Monday, President Jacob Zuma said that the disruption had cost the industry $548m (Â£337m) in lost output. The unrest came as Anglo American Platinum (Amplats), the world's largest platinum producer, re-opened its mines after they were closed last week following huge protests. Amplats spokeswoman Mpumi Sithole said the mines in Rustenburg, the centre of South Africa's platinum mining - about 80km (50 miles) north-east of Johannesburg - were operational. She said the police had "dispersed a group of people gathering illegally at Sondela informal settlement [near the mine]" and said it was not clear if they were Amplats workers. "Police utilised tear gas and stun grenades, and rubber bullets were used at the squatter camp," said police spokesman Captain Dennis Adriao. "As we have said, we are not tolerating any illegal gatherings," he said. Riddick Mofokeng, another miner, said he felt good about the deal. "It is not what we expected to get, but it is great," he said. "Most of the people, we are ready to go back to work." The miners had been demanding a salary of 12,500 rand ($1,513; Â£935) - they currently earn between 4,000 and 5,000 rand. President Zuma has ordered a judicial inquiry into what has become known as the "Marikana massacre" - the deadliest police action since the end of apartheid in 1994. MARIKANA, South Africa (AP) â" Lonmin Platinum's 28,000 miners celebrated a wage deal Wednesday that ended a deadly strike, but labor unrest at a different mine took a violent turn when police broke up what they called an illegal gathering near the town of Rustenburg. That strike is at Amplats mine near Rustenburg, owned by Anglo American Platinum which earlier claimed its workers were not striking, but that it had shut down operations to ensure their safety against violent threats. At Marikana, the scene of the protracted strike by Lonmin miners, thousands gathered and sang the national anthem in piercing heat, holding up umbrellas to block the sun. Workers cheered and laughed as they walked into the Wonderkop stadium in Marikana near the Lonmin mines. Many said they were happy to return to work Thursday and that the strike that saw 45 people killed has finally come to an end. Vinod Hindocha, father of slain honeymooner Anni Dewani, is seen with relatives outside court. Hindocha took the witness stand to identify items belonging to his daughter. Anni Dewani murder accused Xolile Mngeni was "misleading" the court in suggesting that he was beaten by police officers in the hours after his arrest, said police Lieutenant-Colonel Bonginkosi Kwinana in the Cape High Court yesterday. In a trial-within-a-trial over the admissibility of Mngeni's confession statement, his defense representative Qalisile Dayimani contends that Mngeni, after being arrested on the morning of November 16, 2010, was "constantly beaten" while in the police vehicle on the way to find another suspect Mngeni had allegedly pointed out. But to these allegations, Kwinana said: "he (Mngeni) is misleading you." Dayimani claims the reason Mngeni gave a statement of confession to the police following his arrest two days after Anni Dewani's lifeless body was found on the backseat of a car in Khayelitsha, was because he was assaulted by a police officer called Mbali and his pleas to see a district surgeon, as he was not feeling well, were ignored. Dayimani wants Judge Robert Henney to rule the confession statement as inadmissible. Dayimani said upon arriving at the Bellville police offices Mngeni was placed in a room with his hands handcuffed to the back of the chair before being severely assaulted and interrogated as to the whereabouts of fellow suspect Mziwamadoda Qwabe. "At the time the accused was with me he was not assaulted. That is news to me," said Kwinana, adding, "I don't know anything about that (assault)." "As an official of the law, a senior officer, I cannot allow anyone to assault him. I would have to stop them," said Kwinana. In his chief evidence Kwinana had testified that on November 16, 2010, two days after Anni Dewani's body was discovered, he and 12 other policeman, including investigating officer Paul Hendricks, went to Mngeni's home to effect an arrest but could not find him. Eventually, according to Kwinana, Mngeni was arrested at another house in the same street as his home, in the company of three other people. A Nokia cellphone, identified as belonging to Anni Dewani, was discovered in the room in which Mgeni was arrested. Mngeni claimed he got the cellphone from a taxi driver. Taxi driver Zola Tongo, who is believed to have taken instructions from Anni Dewani's new husband Shrien Dewani to organise a hitman to kill Anni, has received an 18-year-jail term while fellow murder accused Qwabe has been convicted and sentenced to 25-years. Mngeni has pleaded not guilty to the murder and abduction of Anni Dewani on November 13, 2010. Copyright Â© 2012 West Cape News. All rights reserved. Distributed by AllAfrica Global Media (allAfrica.com). To contact the copyright holder directly for corrections â" or for permission to republish or make other authorized use of this material, click here. MARIKANA, South Africa â" Lonmin platinum miners celebrated a wage deal Wednesday that ended a deadly strike, but labor unrest at a different mine took a violent turn when police broke up what they called an illegal gathering near the town of Rustenburg. 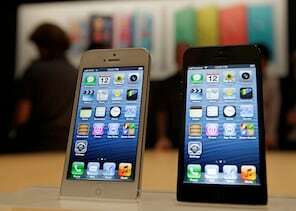 Apple unveiled the iPhone 5 Sept. 12. See how it compares with other smartphones in the market. On a day when the Romney campaign was promising a messaging "reset," they delivered -- but not in the way they'd intended. TransCanadaâs plan to bury part of its Keystone XL pipeline in Oklahoma faces Native American opposition. Company is pinning high hopes on the new Android device to help revive its mobile business. The mine near Rustenburg is owned by Anglo American Platinum. Amplats, as the company is known, has earlier claimed its workers were not striking, but that it had shut down operations to ensure their safety against violent threats. At Marikana, the scene of the protracted strike by Lonmin miners, thousands gathered and sang the national anthem in piercing heat, covering themselves with umbrellas to block the sun. Workers were cheering and laughing as they walked into the Wonderkop stadium in Marikana near the Lonmin mines. Many said they were happy to return to work Thursday under the agreement and that a strike that saw more than 40 killed in August has finally come to an end. Lonmin agreed to pay a gross of 11,078 rand ($1,385) to rock drill operators who had been demanding a monthly take-home wage of 12,500 rand ($1,560). They also agreed to pay all miners a once-off payment of 2,000 rand ($250). A statement from the company said that miners will receive between 11 and 22 percent wage increases. Delegates from unions, strikers not represented by unions, and the London-registered company signed the final wage deal late Tuesday night in Mooi Nooi, close to Marikana. The agreement for the companyâs 28,000 miners ends a strike with political and economic repercussions, but does not resolve the countryâs huge economic inequality and the governmentâs failure to address massive unemployment and poverty.